Last week I was asked to recommend some great hikes for fall foliage viewing for another project. Since we were already debating our favorites, I thought why not share them with you! Our expertise is western Oregon, so we need your help rounding out the list. Share your favorite hikes throughout the state in the comments. And for more ideas, check with the visitor associations listed as “Oregon Tourism Links” on the right side of this blog. The trail follows Fall Creek for 14 miles through second-growth and old-growth Douglas fir and an understory of vine maple, big leaf maple dogwood, and red alder. Choose your distance on this out-and-back near Eugene in the Cascade foothills. Follow the “Trail of Ten Falls” for 8.7 miles along the banks of the north and south forks of Silver Creek past 10 waterfalls ranging in height from 177 to 27 feet. At this 209-acre living tree museum, discover riverside trails, quiet paths through evergreen forests, a water garden teeming with life, bright wildflower meadows, and open views across oak savannas. Patches of red and orange vine maples already brighten the lava fields along this trail. This easy 1.25-mile loop travels through dense forest and open lava fields to views of two distinct waterfalls. This short hike is rewarding for both families and the most experienced hikers. Explored as recently as Monday, this hike comes highly recommended by Travel Lane County staffers. The easy 5-mile Waldo Shoreline Trail offers the best views of Waldo Lake, Oregon’s second largest lake and one of the cleanest lakes in the world, and Diamond Peak to the south. For stunning views of the lake, start your hike at North Waldo Campground. The truly adventurous can connect to the difficult 19.6-mile Jim Weaver Loop National Recreation Trail, which rewards hikers with views of Mt. Bachelor, Broken Top, and Middle and South Sister. After a day of hiking, jump in the lake at North Waldo Campground – my favorite swimming spot on Waldo Lake! Less than 30 minutes north of Florence, the highest lookout point on the Oregon Coast looms beautifully over the crashing surf and jagged coastline at Cape Perpetua. Twenty-six miles of interconnected hiking trails take you from old-growth forests to the Pacific Ocean. This is one of my favorite hikes in the Coast Range. Located east of Florence and near Mapleton, this trail follows Sweet Creek on an easy, mostly flat hike past several small waterfalls. In the summer, it’s a great place to swim, but in the fall, the lush forest comes alive with yellow birch, orange maples, and red dogwoods. We’ve barely scratched the surface of great hikes in the Willamette Valley, the Cascades and on the Oregon Coast, let alone in Oregon. So share your favorites and get out on the trail! While you’re out, take note on how the color is developing and report back. 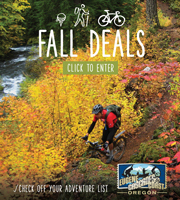 You can reach us in the comments section below, on Twitter @ORFallFoliage, or via e-mail at Adventures@TravelLaneCounty.org.